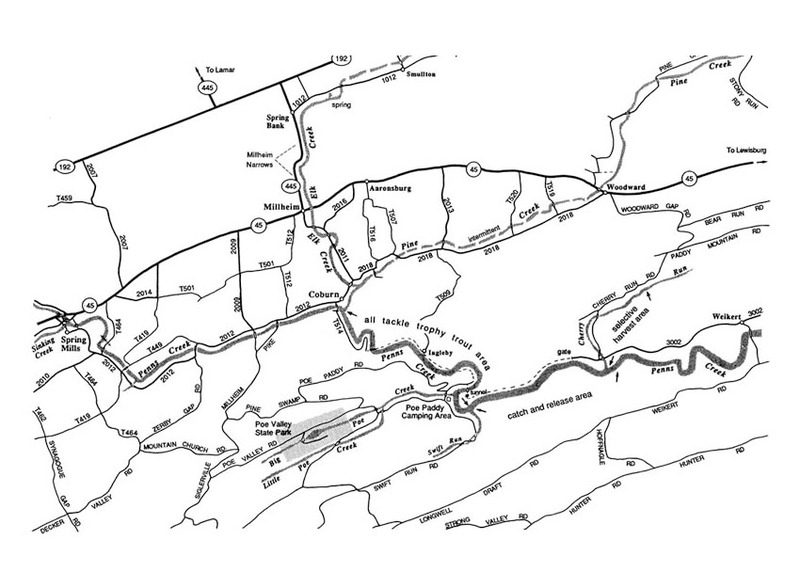 Penns Creek’s 35 miles of trout water make it Pennsylvania’s longest limestone trout stream. Many people associate Penns Creek with Penns Cave--Pennsylvania’s only water cavern, where tourists glide through the dripping darkness in long, metal, motor-powered boats. The stream exiting the cave, called "Upper" Penns Creek, is small--averaging 15 to 30 feet wide. This is the coldest section of Penns Creek, and though the state stocks this section with rainbow trout, very good numbers of wild brown trout are also present. Upper Penns flows for approximately 13 miles from Penns Cave to the town of Coburn, where it is met by two pure limestone streams, Elk and Pine Creeks--fine wild brown trout fisheries in their own rights--which widen Penns from 75 to 100 feet across. Another important addition at Coburn is the maze of rocks, boulders, and gravel that fill the stream bed from this point downstream, providing excellent habitat for trout and aquatic insects. Nearly every species of caddis, stonefly, and mayfly that exist in the eastern U.S. lives in Penns Creek, creating a hatch-matching paradise. This 11 mile section, downstream to Weikert, is rated Class A wild trout water--Pennsylvania’s highest designation--and it is not stocked. Trout average 12-13 inches but 14-16 inch fish are common and larger fish are a real possibility. Much of Penns below Coburn is rimmed by Bald Eagle State Forest’s 195,624 acres. This vast tract of wild, public land provides beautiful scenery and a wealth of wildlife. Fourth of July on Penns Creek, the famous but sometimes frustrating limestone stream in central Pennsylvania. By 10:00 A.M. the temperature had barely reached 58 degrees, and a fine drizzle fell. At the lower end of the catch-and-release section on this holiday, no one was fly-fishing except me. Two other fair-weather anglers had returned their gear to their cars seemingly disgusted with the depressing weather. I was the only nut remaining on the entire stretch of that productive water. I put on a heavy jacket and headed up the anbandoned railroad bed toward the R.B. Winter estate, where I entered the fabled waters. The water level was almost perfect even though it had rained for several hours and was still drizzling. As I often do whein I first enter almost any trout stream, I speculated that this might be one of the best fishing days I would ever experience. In this case, it was! Swallows cruised near the water's surface, crisscrossing upstream, downstream and across stream. Just in front of me thousands of Blue-Winged Olive Duns floated, half-dazed, swirling around in an eddy. Normally this species (Drunella lata) takes off rapidly from the surface when emerging, but the unusually cold weather today prevented the duns from escaping quickly from the water. Five, ten, fifteen trout rose in a small riffle in front of me. I quickly tied on a size-16 Blue-Winged Olive Dun, nervously finishing the improved clinch knot. The leader slipped out of the second loop, and I had to retie the knot. More and more duns emerged and added to the incredible number already resting on the surface. When it seemed like every trout in that section had taken my Blue-Winged imitation, I moved upstream. Ahead of me lay some moderate water with a boulder-strewn area at its head. Here maybe 15 more trout lined up in a feeding lane and fed in a frenzy on the duns. At least 10 of the trout in that stretched sucked in the dry fly. I continued upstreamfor about a half-mile, fishing every pool, riffle and pocket that harbored rising trout. Remember, while this unbelievable fly-fishing over a hatch continued, not one other person took part in the excitement-not one other fly-fisherman shared this memorable experience. Three hours, 65 trout and seven imitations later, I quit. On July 4, 1979, in the late morning after a cold rain, I fished the upper no-kill stretch of Penns Creek from the Broadwaters to the Upper Island. I found the surface covered with tine Blue-Winged Olive mayflies. I fished this stretch with a size 20 midge Adams and hooked and released 30 trout between 10 and 17 inches long. I missed many, many more. The water surface was quite broken as far as you could see with feeding fish. I fished that day in complete solitude (I thought). I was cold, happy and alone. I can remember how my shoulders ached from so many hours, and my thumb had become tattered by the teeth of the many trout I released. I stopped fishing at about 5:00 P.M. because I had reached a state just short of exhaustion. I exalted the cold gray heavens above me and gave thanks for such a wonderful and unique gift. So when I read your book and came across the passage on your experience at Penns Creek, I wondered what the odds were that such conditions had occured more than once on a fourth of July in the past 10 years; a cold rain, a great hatch of Blue-Winged Olives and nearly deserted stream. If our two days were separate in time, than a statistical phenomenon has occurred to be noted! But if, as I hope, those two days were one in the same, then I am glad to know that one other person was able to share the exhilaration I felt that day. Those days, when all things come together, are few and far between and should never be taken for granted. What makes Penns Creek such an excellent trout stream? Hatches? Number and size of trout? Good water conditions all year long? Beautiful scenery? Plenty of open space to fly-fish? All of the above. What fly-fisherman hasn't heard of the great Green Drake on this hallowed stream? What fly-fisherman hasn't had reports of lunkers caught during this hatch or following spinner fall? Penns Creek has received much notoriety in the last few decades, and much of it is warranted. Superb fly-fishing develops early on Penns Creek. The lower section around Weikert has a decent Hendrickson hatch around April 21, and most of the stream contains a concentrated caddis fly, called the Grannom, about the same time. Joe Dougherty, of Lewisburg, has fished the Hendrickson hatch near Weikert for years. He says the hatch never gets extremely heavy, but still it brings plenty of trout to the surface. The Grannom on Penns can be as frustration and rewarding as the Cream Caddis is on Pine Creek. Thousands of caddis flies in the arie this early in the season thrill many fly-fisheran but often don't pursuade many trout into rising. Many times the air is filled with large dark grannoms on this fertile limestone stream, but no trout appear. Penns Creek emerges from a limestone cavern at Penns Cave just a couple miles north of Spring Mills in Centre County. It is a cold, productive alkaline stream for the first five miles, but much of the water north of PA 45 is posted. From Spring Mills six miles downstream to Coburn there is access to most of the stream. The section, however, with the heaviest hatches and the largest trout is the 15-mile segment that extends from Coburn to Cherry Run. Just upstream from Coburn, Penns is slowed by several small ponds and lacks any protective canopy. As a result, this section warms quickly. But just a few hundred yards below Coburn, a cold limestone tributary, Elk Creek, enters. Elk injects a generous amount of cold water into the main stem, creating a great trout stream for the next 20 miles. Access to the section from Coburn to Cherry Run is limited. You can reach the upper section by driving to the old railroad tunnel about three miles below Coburn, then hiking dow to the old railroad track. Or you can enter at Ingleby from the north or Poe Paddy State Park from the sout. Access from Cherry Run section is no problem. A road parallels the creek down to Weikert. The section around Weikert is marginal. The Fish Commission has set aside a four-mile section near Cherry Run as a catch-and-release area. Fly-fishing on this part of Penns produces lunker trout during the Green Drake hatch. Penns is most often reknowned for its Green Drake hatch in late May. Fish the stream when the "Shad Fly" is on, and you'll meet hundreds of fly-fishermen on the water, each with his or her own favorite pattern to match the upcoming hatch. It often happens when the Green Drake appears that five or six other significant aquatic insects arrive on the water at the same time. Anglers may become frustrated with this diversity of insects, buty many continue to use the Green Drake even though trout are feeding on another phase of the same insect (like the emerging nymph), or are surfacing for a Light Cahill, Sulphur, Sulphur Spinner, Gray Fox, Ginger Quill or one of the many other species. More times than I care to remember I've quit the stream in disgust in these confusing circumstances. Like so many others who plan to fish the hatch, I use a Green Drake pattern no matter what else takes place that evening-a serious blunder when you're fishing the hatch on Penns Creek. It's mid-June, however, and the hordes that have visited Penns are gone for another year. What happens now? You already know that Penns hosts a fantastic Blue-Winged Olive hatch. But it contains more hatches even later in the season. Slate Drakes (Isonychia matilda) emerge on many September afternoons in enough numbers to bring trout to the surface one more time. By that time of th eyear the water is stil in the mid- to high 50s in the afternoon and the air is cooler. These cool days prevent the Slate Drake duns' typically speedy escape from the surface. Fishing when this hatch appears can be your last triumph of the season. Penns drains six main tributaries. Sinking Creek enters at Spring Mills, addint tannic acid and warm water to the main stem. Sinking Creek's headwaters are in the boglike area of Bear Meadows. Downstream 10 miles the largest and most influential tributary of Penns, Elk Creek, joins. In the Poe Paddy State Park area Poe Paddy Creek and Swift Creek flow into Penns. At the lower end of the catch-and-release area Cherry Run, another excellent tributary, adds volume. A few more miles downstream Wiekert Run enters. Wading on Penns can be treacherous. In some areas deep pools lined with huge hidden boulders present obvious problems to the angler. Other sections, especially from Coburn downstream for about five miles, are easier to traverse. The summer of 1988 was extremely unkind to Penns Creek. The state experienced more than 30 days with temperatures higher than 90 degrees. Joe Dougherty and I met in early October at the Blue Rock Hole in the catch-and-release area to fish for a couple of hours. We saw dozens of Slate Drakes on the water and hundreds of Black Caddis, but no feeding trout-not one trout rose in two hours. Joe and I are convinced that the high water temperatures took thier toll on the lower end of Penns Creek. Penns Creek continues to suffer from high summer temperatures. Anglers fishing below Poe Creek in the Summer of 1991 said they saw many dead trout during that unusually hot summer. Try Penns after the hordes of fisherman have abandoned it for the season. Fish this famous stream in late June for the Blue-Winged Olive Dun in the morning or firsht the spinner fall in the evening. You, too, will praise its hatches and trout. See the Hatch Chart and Stream Maps for more information on Penns Creek hatches as well as best times and places to fish. Also, please visit Charles R. Meck at (charlesmeck.com) and look at his great selection of fly fishing books and his current schedule of appearances, book signings and educational events.